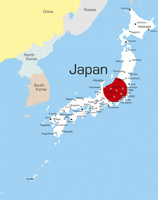 Japan is an island nation that is located in East Asia. Japan is sometimes known as “The Land of the Rising Sun” and even though its history goes back for thousands of years and they retain a lot of their ancient culture, they are also headliners in some of the most modern technology, fashions and trends. The country is a very homogeneous one, meaning that almost 99 percent of the country is made up of only Japanese people. The people in this country are well known for their politeness, so if you find yourself lost or bewildered while visiting, you will probably find someone who is most willing to help you. If you do travel to Japan, a passport is almost always required, however you will probably not need a Visa if you are from one of the 62 countries that have agreements with Japan about travel in between countries. Listed below are some of the top tourist attractions in Japan for sightseeing. Find information about Japanese famous landmarks and top tourist spots to visit. Plan your trip in advanced and enjoy your stay in Japan.